Fifth Avenue's 58-story Trump Tower is made up of 5 retail floors, 14 office floors and 39 floors of residential units. The top three floors of the building are combined into a single penthouse suite, historically occupied by the Trump family. These penthouse floors are numbered 66, 67 and 68, however, because the building directory skips floors 6-13. The developer (Donald J. Trump) claimed the high ceilings of the public atrium justified higher floor numbering of the residential floors. And so, the residential floors are numbered 30 and above. The city’s Buildings Department allows this practice as long as the floors are counted accurately in the building’s certificate of occupancy. According to New York City's Department of Finance, Trump Tower was completed in 1983, has a building area of 626,000 sqft and is tax assessed at $181.7M. Trump Tower is owned by GMAC COMMERCIAL MORTG. The graphic below illustrates the tower amongst notable skyscrapers in Manhattan's Plaza District. 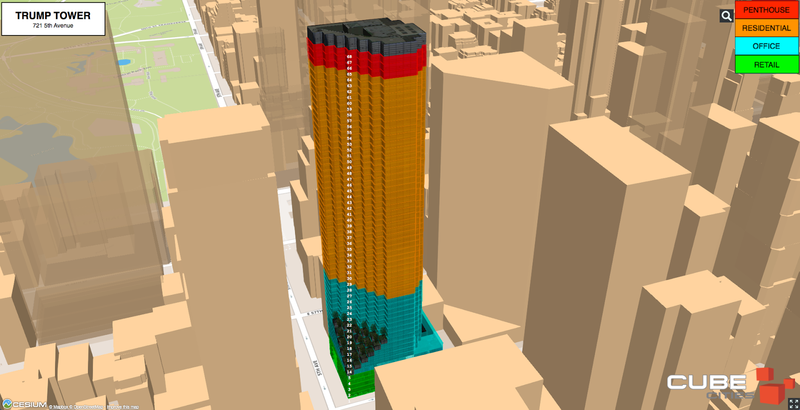 This is a screenshot taken from our NYC OpenData 3D visualization app which reveals property data for every building in New York City. Hi, what's the "NYC OpenData 3D" app you refer to? I see https://cesiumjs.org/NewYork/index.html but it doesn't have the internal floor colourings. 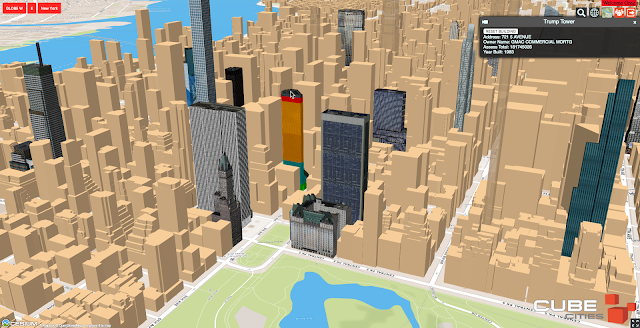 Hi Steve, we provide a commercial application that visualizes NYC OpenData in 3D.